As a marketer, you know user-generated content (UGC) can be a fantastic resource for your destination. Sharing traveler experiences is an authentic and powerful source of inspiration – but only if you can find the best UGC to promote your destination. With today’s travelers creating and consuming more visual content than ever, there’s tons of UGC to sift through. This makes finding the best visual content time-consuming and challenging for DMOs of all shapes and sizes. That’s why Destination Canada has adopted a country-wide UGC Partner Network – to make sourcing UGC visuals a lot more collaborative and efficient across DMOs. Let’s take a look at what the network looks like, how it came to be, and how it has benefitted Canadian travel brands. As many DMOs in the province of British Columbia were early adopters of UGC in their marketing, they were some of the first in Canada to think about a better way to come together as a province to leverage the power of authentic visuals. This challenge sparked the idea of having a way to streamline UGC curation across tourism partners – which was along the same lines as what the country DMO, Destination Canada was putting in the works. Today, provinces, cities, attractions and tour operators all over Canada are a part of this a country-wide network, which is established as Canada’s UGC Partner Network, powered by CrowdRiff. 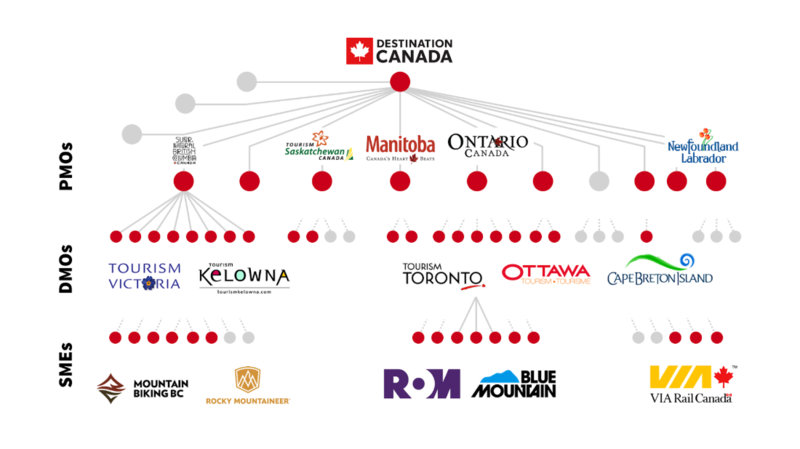 The network brings together thousands of Canadian tourism organizations, including DMOs, museums, resorts, and train companies. 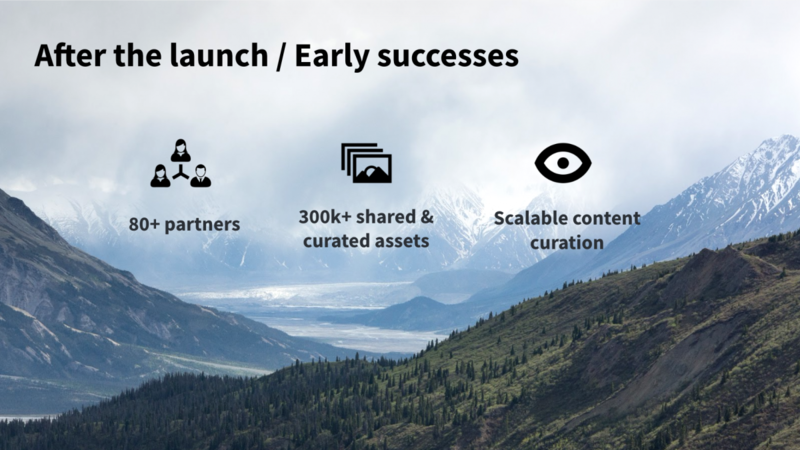 Here’s how it works: whenever a partner collects and curates UGC visuals, it then automatically becomes visible with their city-level DMO or provincial-level DMO and added to Destination Canada’s network. The diagram below can help you visualize the size of the network and its breadth of connections. For example, Tourism Toronto can see all the UGC the Royal Ontario Museum is using; Destination Ontario can see everything Tourism Toronto and the Royal Ontario Museum are using; Destination Canada has visibility into it all. This helps organizations quickly find the gems amongst the rest of the content on social media. Destination BC’s homepage features UGC from all across the province – and these images are first curated by local partners in their network. The same goes for all the other ten provinces who are in the Partner Network as well as Destination Canada itself. The Partner Network also reduces duplicated effort for affiliated DMOs when curating photos. So, before the Partner Network existed, if a provincial DMO wanted to find a canoeing photo, they’d have to start their search from scratch, whereas now, they can search first through the canoe photos their partners have already chosen. Providing truly relevant, personalized content to potential travelers is essential to drawing more visitors to a destination. However, reflecting the cumulative experiences of an entire state, province, or country is impossible for a single DMO to accomplish on its own. That’s why Destination Canada’s UGC Partner Network is so important. It’s now possible for DMOs from across the country to collaborate together to surface the most important visuals in Canada. Not only is it changing the way DMOs and travel brands promote their individual destinations, but it’s created a commonwealth of content that destination marketers can use to showcase the diverse Canadian experiences. A big thank you to Graeme Leathem from Destination British Columbia for shedding light on Destination BC’s Partner Network experience and expertise with us. 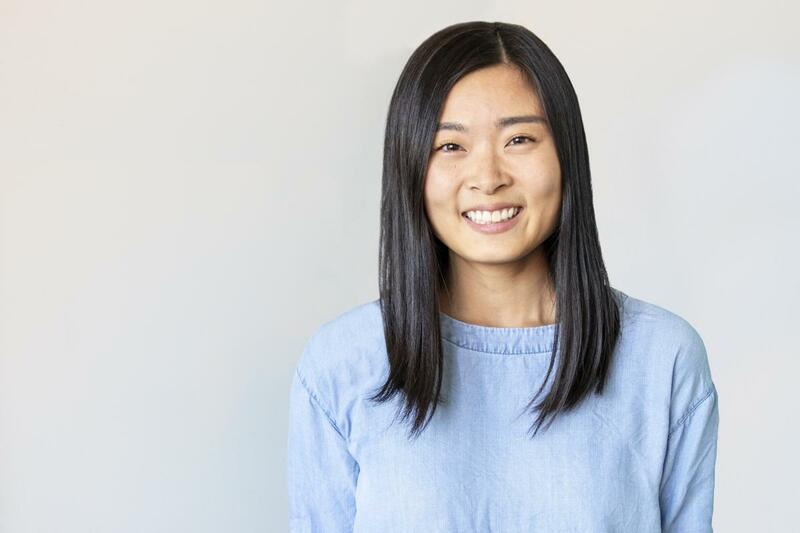 Elizabeth Ching is the Content Marketing Manager at CrowdRiff, a visual content marketing platform built for tourism and travel. From connecting with destination marketers to pick their brains, to researching and writing eBooks for the travel industry, Elizabeth is always on the lookout for creative campaigns and stories to share.